It happened a little over four weeks ago. 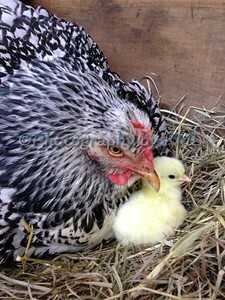 After sitting on her clutch of six eggs for three weeks, the first little peep hatched. Mama was very protective yet proud to show us her baby chick. Over the next couple of days two more little ones joined the first. We candled the other three eggs, and since they didn't have any chicks, we removed them from the nest box. Watching these little chicks grow has been a great experience. And watching Mama teach them has brought many smiles. To see these small chicks mimicking the larger ones is too cute - especially the dust bathes. More pics to come, for sure!